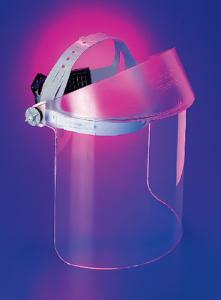 These one-piece face shields provide eye and head protection. The scratch-resistant shields are 20% larger than standard shields. Optically clear and injection molded without waves or distortions, the shields also feature a chemical-resistant coating for further durability. Certifications: Meets ANSI Z7.1-1989 standards.